December is upon us, and that means Christmas is only weeks away. I love finding gifts for loved ones. Of course, a good Christmas list comes in handy. But my favorite presents to give are those special items that I’ve spotted while traveling or running an errand. I’m not expecting it, but I suddenly find the perfect thing for a loved one standing before me. This year, I’m especially happy to kick off December with a giveaway from our sponsors at Ross-Simons. Perhaps you remember their gorgeous jewelry from this spring, when they offered a lucky winner a lovely fresh water pearl necklace. Well, they’re generously offering another special holiday giveaway today. A well-loved jeweler for more than 60 years, Ross-Simons is offering a matching bracelet and necklace pair this Christmas. You can win their gorgeous 24kt yellow gold over sterling Byzantine and oval link necklace and bracelet, both beautifully adorned with a lion clasp. Perhaps it’s just the thing for a loved one or a special gift for yourself this year. To enter, share this post via one of the social media buttons below, and leave a comment telling me why you would like to win. Write about it on Facebook, pin it to a favorite Pinterest board, or even send a tweet. Not a social media person? Simply leave a comment below instead. I’ll choose the winner on Friday so that it can reach you in time for Christmas. Best of luck! Why would you love Ross-Simons jewelry for Christmas? I always admire jewelry especially bracelets… I would like to have it on my wrist. i love bracelets and this one is very beautiful….. Please could i win this so i can give it to my beautiful wife? I would love to win this for my best friend, she always looks so beautiful in gold, and I have been struggling to figure out what to get for her for a while now that would be as special as she is! 🙂 Thank you! Dear Phyllis, What a generous offer! This set is lovely, and I know it will liven up any outfit during the Christmas Season and beyond. Thank you very much for all you do to promote Southern hospitality. Merry Christmas to you and your family. I really like the circle of shiny golden links. It seems as though it could be a circle around the Reason we celebrate this beautiful season. An everlasting reminder. So beautiful. I love Ross-Simons jewelry and I would love to win this lovely prize. I am in the whirlwind and doldrums of Holiday planning, buying, wrapping, baking and all those other things that make this season so overwhelming. So I am going to just be honest…I would love to have this just for myself to pamper myself. Yup, I know it isn’t the sentiment, but I am the one who does Holiday in our house and for the entire family and I would love to have a little reward. This is beautiful. Thanks, as always for sharing with us. Happy Holidays from my little grinchy self, haha! All I can say is, this is such a beautiful matching set that I would be so happy to have it that I would probably wear it everyday! I would love wearing any Ross-Simons jewelry . This is a lovely necklace. I like that it is chunky; I am not a fan of the really fine chains that so many pendants are on. Tweeted! Thank you for offering this. It would certainly be a lovely set for my daughter when she gets big enough to wear it! Would make a lovely gift for my “new mother” granddaughter ! This lovely jewelry would make a wonderful gift for my daughter. She is completing college and trying to frugally establish a timeless and classic wardrobe that will last for years. These pieces would be a wonderful start to a jewelry collection. What a nice gift to receive….most generous of you for some lucky reader. What beautiful pieces. I would give one piece away to a friend who is so generous with others and has for little herself. I love your blog. So “southern”….it reminds me of my parents and our home in Georgia. I miss those days. At the holidays I feel very nostalgic. I would love to win this set and gift it to my Mother for Christmas! She would just absolutely LOVE it. What an incredible offer. Thank you so much Phyllis for bringing a little glamour into someones holiday season. Hope it will be me. Thank you for the generous giveaway. I would love this classic and timeless jewelry. Merry Christmas to you and your family! I would love to own a piece of this timeless jewelry from Ross-Simmons, thank you for all these chances to win and Merry Christmas to you and yours! Perfect timing for such a lovely – and regal – jewelry set. Thank you for a beautiful glimpse at the world through your writing, and this generous offer. I love the look of this beautiful timeless jewelery. I obtained my BS of nursing, worked 30 years while I raised my family, then went back and obtained my MSN. I have worked another 11 years, then was recently laid off. I decided to retire, and plan to volunteer at a local health clinic. No retirement party,or any kind of recognition, but this would be an exquisite retirement gift to myself. I look forward to logging into my e-mail and experiencing each and every new posting of The Ribbon In My Journal! It is always a welcomed beginning to my day! Especially during this time of year we all want to be mindful of our many blessings. I consider this blog to be one of them! Thank you for the opportunity to participate in giveaways like this one and, for offering us the chance to win this beautiful jewelry. Happy holidays to everyone! I love browsing the Ross-Simons catalog. And occasionally, my husband orders something from it to surprise me. I never have too much jewelry, so it would be wonderful to win this set. What a beautiful bracelet! Thanks for the reminder – I’ve purchased from Ross-Simons in the past and always been pleased. I would love this for my wonderful daughter in law who made me a grandmother for the very first time recently! Absolutely elegant! This would look beautiful on a brand new, first time grandmother. Me! Oh how beautiful! I discovered this company years ago but have never purchased a piece from them. Thanks so much for the opportunity to be selected. So elegant and classy! I wish I could say that I would give this wonderful set away, but in all honesty, I would be thrilled to receive it myself. As my 4 year old daughter stated years ago when I asked her to share her candy, “I’m going to share all by myself”. Thank you very much for the thrill of anticipation! Would love this classic piece. My engagement ring is from Ross Simon (wedding ring was custom made to match) have inherited many pieces that were from Ross Simon as well. Needless to say a favorite in our family. What an absolutely beautiful set! My birthday is also this month and what a lovely gift it would be. Some may find it absurd that a magazine could so strongly influence choices one makes. But for me, “Victoria ” has done just that. Since the premier issue in 1987, I have been squirreling my issues away until the time is right for them to be reread. Issues that are twenty years old are just as timely today as they were when they were first published. As my tastes and interests have evolved, sometimes, the second reading offers more than the first. My house, my garden, and my choice of pet, are all a reflection of a magazine that speaks so personally to me. Not long after reading an article in an early issue about Elizabeth Barrett-Browning and her constant companion within her sick room, I found myself collecting a Cocker Spaniel puppy. We now have Spaniel number four, and they have proven to be as dear to us as Elizabeths was to her. Owning and wearing the beautiful Ross-Simons set would be a constant reminder of a publication that has taught me to find my comfort zone and to spend as much time as possible within it. Such elegant jewelry would remain stylish and timely in the years to come, just like “Victoria” continues to inspire and enchant today. What a beautiful set. Would love to have this lovely gift. Thanks so much for giving us so very much all year. Merry Christmas to you and to all your readers. I would very much like to win this lovely set. Yellow gold is my favorite. What a generous offer. What a stunning set of jewelry! Yesterday, I completed all the requirements for my PhD, at the age of 60. Academia has always been my passion. Receiving jewelry such as this would, in this case, be a crowning statement, per se, of strength, hardwork, and perseverance as well as future gifts for my two daughters! I have passed on the love of learning to all my children; however, my two daughters might appreciate a piece of mom’s jewelry with meaning! Blessings to all this holiday season. That is such a lovely set. And it is very generous to offer it as a prize. I suspect I am not eligible to win because I live outside mainland USA. But on the off-chance I am wrong about that I will enter. I would keep this jewellery because there is no way I could ever part with such gorgeous pieces. The workmanship is so intricate. The link to the past is so inspiring.The generosity is so outrageously huge. It is way way way outside my world view. And I just plain love it. Someone is going to be very lucky indeed. What kind hearts you and the jeweller have. I would love to win this lovely set! I have a Christmas birthday, (and this is a big one coming up!) so it would be an extra special treat. Thank you for the opportunity! Who wouldn’t love to receive this unique jewelry! That is FOR not fro! What a lovely set! It would be perfect for my sister this Christmas. Than k you fro such a nice giveaway. I’m a fan of Ross Simon–just wish they hadn’t exited the fine china business several years ago. They were my china gift go to back then. My husband always tours me by their store right around the holiday for a “look”. Of course I miiight just have cruised by there on my own a few days before the “look”, but my secret is safe with all y’all-right?! Who wouldn’t love to own this gorgeous jewelry? ? Count me in! This is a giveaway. Who wouldn’t love to win this giveaway. Thanks for this great giveaway. I would love to win this gorgeous piece of jewelry. Thank you for this generous giveaway. Ross-Simmons’ jewelry is always in the best of Southern taste. Often understated but with a certain flair that sets it apart from the ubiquitous. Gold is so classic, never goes out of style, Ross Simons is always a winner. What a lovely Christmas give-away. I would love to surprise a sister whose daughter passed in July. I have in mind to pretend an angel is sending the necklace to her. One beautiful lady will be the lucky recipient of Ross Simon jewelry ! I have ordered from Ross Simon several times . Lovely and fine quality pieces . I receive the catalogue and there is always temptation to order something new! Wonderful way to share with others! I would be thrilled to have this lovely set! I have always loved gold jewelry! Classic. Beautiful. I am a gold girl in a sterling world! It never goes out of style. Never. I have fond memories of Ross Simons. When my daughter was in medical school at the end of every year I would gift her with one of their pieces. She has a lovely collection of their jeweled pieces and still wears them today. I would love the gold pieces to surprise her again. Thanks for the possibilities. A perfect touch to brighten up my stale wardrobe. Thank you for the opportunity. This would be a wonderful surprise to find under my tree this year. Every lady should treasure her signature piece and this certainly does make a statement. I have a dear friend whose friendship I have treasured for 56 years. She gives of herself and her time to everyone without question. I would be thrilled to give her this as a symbol our lasting friendship. She is more than my friend, she is my sister of the heart. What a lovely opportunity for someone to receive. Good luck to all! I shared on Twitterhttps://twitter.com/Brittles526/status/671803714085240832 . Would love to win because I love jewelry and this is very pretty. This bracelet and necklace are so very beautiful and I would love to own them and pass them on to my daughters. Thanks to Ross-Simon for these lovely items. I would be proud to own and wear these pieces. They are worthy of passing on to my granddaughters. Thank you for this opportunity. I love this beautiful necklace and bracelet set–Ross-Simons has lovely jewelry–have several pieces ordered over the years and they never fail to get compliments. Would love to have this gift for the holiday season. How beautiful! Who doesn’t love new jewelry? It is always in style! This classic jewelry would be a wonderful gift for my 97 year-old mother who always looks elegant and takes pride in her appearance. Thank you for the opportunity to give this gift. I collected lions when I was younger and love, love any type of jewelry, the combination of the two speaks to me. It is a symbol of hope, strong with courage, and surrounded by grace and love. I would also leave the bracelet to my daughter and necklace to granddaughter, after it has been enjoyed and worn many times. I am still recovering from my husband’s death due to cancer! It has been 4 years now, and I am still a bit down. Friends just do not understand why I am still grieving. Having given my all to him while he was ill, I would really welcome something for myself for a change. This necklace/bracelet set would really help my joy. I’ve looked at Ross-Simons catalogs and drooled for years. This necklace and bracelet would go with any outfit. Thanks Ross-Simons and Phyllis for a great giveaway. 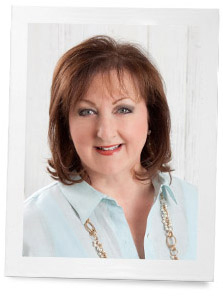 Look forward to your blog each time Phyllis. I love ross simon jewelry, this piece is adorable, I would love to win!!! I am thinking of the words to a song that says “The lion of Judah shall break every chain, and give us the victory again and again. A appropriate sentiment for this hurting world. This jewelry set brings all of that to mind. Thank you for the opportunity to win. Merry Christmas. I’m a Leo and I love yellow gold jewelry. This would please me so much. This is a set that would fit any occasion. Dress it up, dress it “down,” be casual, be formal. A set like this would solve the dilemma of choosing the proper jewelry for any occasion. Think how striking it would be against black, red, green–the colors of the season, and how it would complement the colors of fall and set off the spring and summer color choices. Would be wonderful to own. I instantly thought of “The Great Lion of God” when I saw this beautiful necklace and bracelet set. In a year which I took to calling my Lost Year, God has sometimes seemed silent and far away. In February my daughter was diagnosed with breast cancer, in March she had to have a mastectomy. The last day of April, I fell and broke my right arm, causing me to be unable to work outside during the critical spring planting and help my husband on our farm. In September, our beloved border collie, Laddie, was struck with a stroke and died a couple of weeks later. Just last week, I said to myself, “I must stop calling this year Lost, and find the good in it.” To that end, I thanked God for my daughter coming through the cancer well and claiming her life once again. I remembered sitting at my computer for hours, typing with one finger on my left hand as I completed my manuscript of people who had seen angels, and sent it to my agent. Time I would not have had without being injured. Then I thought of our Laddie joyously bounding in heaven, where God cares for him now, forever well, sick no more. And realized there Was good in the midst of those tears. Is it a coincidence that today I opened my messages and found this reminder of God? I think not. To Kristi would go the necklace, a reminder upon her breast that God is with us always, while I wore the bracelet on my right wrist, in remembrance of the lessons learned at the hand of The Great Lion of God. Thank you, Phyllis, and Ross-Simons. May God bless you all. I love beautiful jewelry that is gold, simple and classic. So this would be just “my style”! Ross-Simons has great jewelry and I would love to have this set! My husband bought me their gold Byzantine bracelet that was advertised in your last issue if Victoria and I love it! Thanks so much for your blog and the giveaways! At first, I thought I would like to have this set for myself. After all, my kids call me the Queen of Bling! But then I thought about my sister, who has given so selflessly over the last few years. She took care of both of our parents until they passed; shortly after that she and her husband took legal custody of 5 of their grandchildren. So in my opinion, she deserves something nice and this jewelry is it! I would love to give this beautiful necklace to my amazing mother who is close to 103 1/2 years old. She is still enjoying a beautiful life and has an incredible memory and interest in what is happening in the world. What could be better than having her adorned with this fine jewelry. Would love wearing something so beautiful to a special Christmas party! I feel Like I know you Phyllis. I love your posts.. and have all your magazines and books. Love the jewelry.. am a big fan of bracelet and necklace sets. Someone will be very happy and surprised to receive it. Just simply because it is beautiful. Once again, I am loving your wonderful messages on your blog. The Ross-Simmons jewelry is simply stunning-a fitting reflection of the loveliness of the Christmas season. The beauty of the necklace and bracelet will enhance the happiness of the person lucky enough to win it and wear it!!! Thank you for your part in this giveaway, and Merry Christmas to you and your family !!! You are always so kind to share such wonderful things with your readers. The jewelry is beautiful and unique. I would like to keep a piece and share a piece – a way of passing it forward. I have admired this jeweler for years. To have a piece of his fabulous work would be a lifetime treasure. Oh my goodness! These pieces of jewelry are simply stunning! To own a Ross-Simons set like this would be a dream come true! They truly do create exquisite pieces of jewelry. During this time of year,the lion and lamb are frequently pictured together symbolizing peace.This jewelry is an elegant symbol of the same. May our lives reflect it throughout the year! Thank you for hosting such a generous giveaway! I don’t own anything by Ross Simon although I am an admirer. It is always wonderful to add some important jewelry to an outfit to make it really special. This set is especially beautiful and would fabulous during the holidays or anytime I felt like feeling extra put together! I have several pieces of jewelry from Ross-Simons, but none like this. I really need a gold bracelet and a heavier gold necklace, so would love to win them. I feel you are a kindred spirit and so enjoy your posts. Ross Simon has always offered quality. This lovely jewelry would be a joy to wear. Many thanks to RS for their generosity. I shared it on Facebook, but would also like to add what a stunning and unique set this is! This would definitely help with my Christmas shopping- and I know exactly who would get it! Here’s hoping!! this would be for “how much I deserve this” as I put it on. Absolutely gorgeous. Your posts are inspiring “gifts” throughout the year. I would love to win this gift to send to my 89 year old Mom! She would be dazzled! Beautiful!!!!. The problem would be “who to give it to”. So….. I just need to keep it for myself if I win. thanks for the opportunity to win. I would love to win this stunning set. The design is elegant and timeless and will be a gorgeous accent for various outfits and occasions. Thank-you to Ross-Simon for their continuing generosity. This is a beautiful piece of jewelry and such a generous gift. I would love to add it to my jewelry and share the beauty and generosity with my friends. Timeless!! That is the look of this jewelry. This could definitely become a family heirloom. I would love to give this beautiful set to my daughter for Christmas. It will be our first Christmas without my mom and my daughter just got married in November so this will be a special Christmas for all of us. I commend Ross Simon for their generosity to those of us who follow your posts! I so enjoy all you offer us by way of your special knowledge regarding so many subjects. I look forward to your emails. The necklace and bracelet are just lovely! My sincerest best wishes to you for a blessed Christmas season. Would really enjoy such a lovely gift. Love Ross Simon jewelry. These lovely, classic pieces are exactly what my mother, grandmother, and great grandmother wore. Upon their deaths I received their jewelry, wearing it often. With a heavy heart I had to sell their lovely jewelry in order to care for my parents when they entered a nursing home. Thought those family treasures can never be replaced this jewelry would make my heart sing and become treasures to hand down to my daughter and granddaughters. What a very special piece of jewelry for Christmas! i’ve actually not heard of Ross Simons, but I see the jewelry is beautiful! I’d love to be included. I subscribe to your blog via email. I have always loved Ross Simon jewelry but have never been able to afford it so this would be a wonderful oppertunity for me to get a chance to own a beautiful necklace and bracelet. Fingers crossed! I have admired the ads for their jewelry in Southern Lady magazine for a long time. 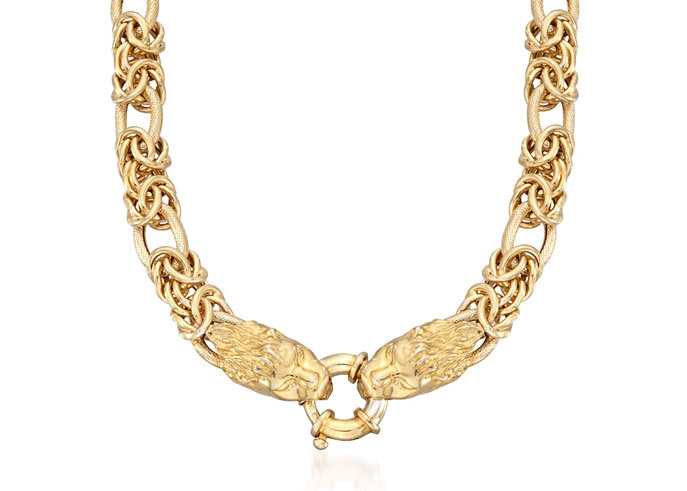 I am very picky about my jewelry – but this piece may entice me to stay with them. Just beautiful! What a great Christmas treat to have. Thank you for the chance to win. What a beautiful piece of jewelry. The winner will enjoy this piece. Each Christmas and birthday I send beautiful Ross Simon gifts to my sisters, my daughters-in-law, and my granddaughters, but I never buy for myself. Would be great to have a nice piece for me. This is definitely going on my Pinterest board “fashion”. It immediately made me think of my daughter since her family away from home, Phi Mu, has the lion as one of it’s primary symbols. The style of the chain is absolutely gorgeous! How lovely would it be for my daughter to receive the bracelet as a Christmas surprise and for me to wear the matching necklace. A bit selfish for me to wear a piece instead of giving both to my sweet daughter, but having both of us wear these stunning pieces would also be a beautiful, touching symbol of the bond we share. This set reminds me of my mother, who sadly passed away in 2007. Were she alive, it would be the perfect gift for her. So should I win, it would be a gorgeous remembrance of her love of beautiful things. Thanks Ross Simmons, Thanks Phyllis! Beautiful pieces. I especially love the lion head clasp. I would love to win! Beautiful and oh so special – I’m a leo and love lions! Thank you for the opportunity to win! I have never heard of Ross Simon jewelry. It is gorgeous and would be absolutely honored to win and wear with a happy smile. I don’t have anything like this and simply don’t have the extra money it would take to purchase this. I don’t have any “real” jewelry at all. This is beautiful. I wish you and yours a Merry Christmas and I enjoy your blog. Classic, lovely, and charming – I would happily wear these pieces, telling one and all how I received them. I “ooo and ahhh” at products viewed in the Ross-Simons catalog. The jewelry looks worthy of a princess. It would be a treat to wear a piece from this renowned company. Just lovely to have the opportunity. What a wonderful kick-off for the Season. Thank you! I would love to win this beautiful piece!! Phyllis, thanks for your wonderful magazines and posts. I enjoy every one! Thank you Ross Simon, beautiful jewelry! Would love to have it for the holiday season and all thru the year. Thank you Phyllis! Merry Christmas to you all! Fabulous prize! I love Ross Simon. I have purchased items from them before and have always been happy. Drool over many of their pieces in the catalog. This is quite a beautiful set! Would love to have this! What a gorgeous set! And so very generous of Ross Simons to give it away! Merry Christmas!!! It’s been years since I got jewelry for Christmas. I love Ross Simmons,and this piece in gold is beautiful. A real go to piece, that can become a signature piece! But after reading another entry above by “Jane” were her friend lost all her jewelry in a robbery…….well I hope you let her win this for her friend. It was just good enough to see this pretty piece. Wishing all at Southern Lady a joyous and very Merry Christmas. I love y’alls work,so inspiring for me. It always encourages me to read your magazines, especially when I have my lupus flair ups and get sore, cheers me! Absolutely beautiful jewelry. Classic and timeless and will go with anything! The jewelry is beautiful and what a way to update my jewelry and outfits. This is a beautiful set. It would look wonderful with my Christmas eve sweater, especially during the time of year when every penny I have to spare is going to others! This is a beautiful piece and I would love to have it and wear it but I would probably regift it to someone else in the spirit of Christmas. I feel I have so many blessings and while I cannot afford to do as much as I would like for others, winning something of value would be a great opportunity to make someone else’s day a little brighter. I would love to have this to give to my daughter-in-law as she has fought breast cancer this year. She is the most positive person you will ever meet. i don’t usually buy jewelry for myself, but would LOVE to be indulged by you with this beautiful necklace! Would love to have this Ross-Simons work of art. I especially like their unique and classy style. A perfect gift! I do not have a 24k piece of gold jewelry, this could be my first piece! Love the glow that it gives off! Merry Christmas and/or Happy Holidays to you and your family. This would be a very lovely gift to give to a very special person. Wow! This would look great at Mardi Gras! I love it, and would love to win and wear it! 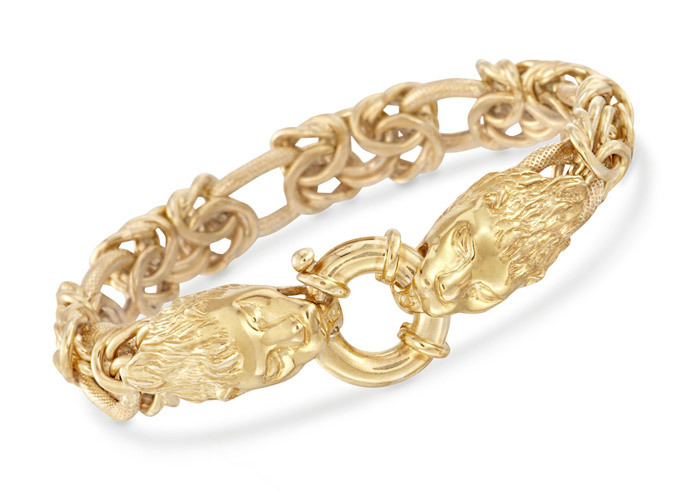 The Lion details are beautiful- I don’t have enough fine jewelry and this would definitely start off a great collection. I would love to have this to give to my precious daughter who gives so much love and support to others. What a gorgeous and generous prize. I would love to be the recipient of this lovely gift. Love this beautiful jewelry set! Perfect for adding that “special touch” and updating outfits for the holiday festivities!